Welcome to the hichhikers guide to Silicon Valley, California. It’s one of the worlds most innovative places, but to the outsider it definitely needs some help navigating. 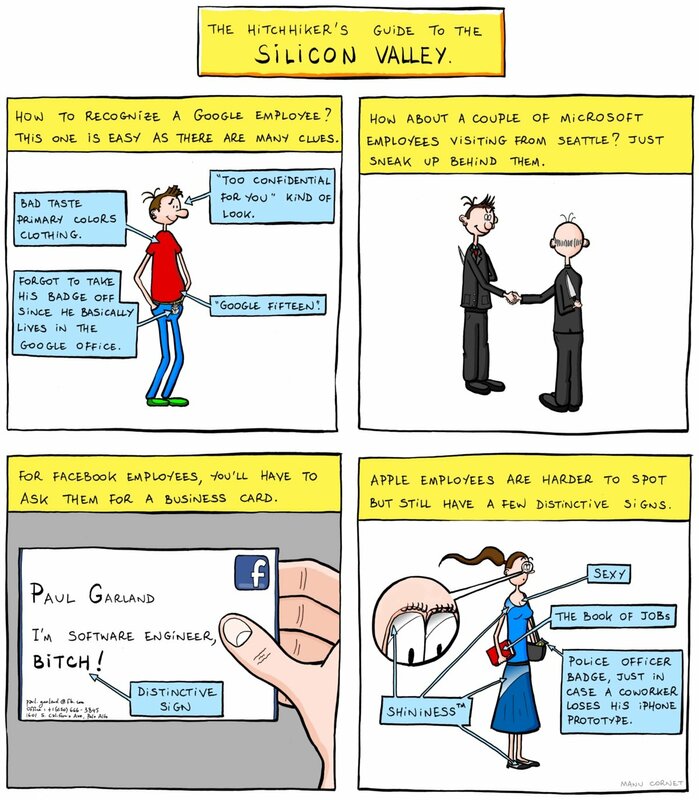 Whenever you go to the valley, a fun game involves identifying Facebook, Google, Microsoft and Apple employees. They all work in a similar space, but as any valley insider knows, they’re very different to one another. To get the inside track, and to master this game – check about the above graphic. Some, like Facebook employees, take a little more espionage to identify. Others are easier, like the google bowfins in their primary colours. But what about Apple insiders, how do you spot them? Or the business brains of Microsoft when they rock into town from Seatlle?